New endless runner game with new appearance and gameplay. Why I said its new? Not just it's a fresh released at AppStore, but I like the gameplay and the graphics too. Though, I'm not a retro game lover, but I still like the graphic, reminds me about the game when I played in childhood. If you knowing an endless runner game such as Temple Run, which you mush swipe right, swipe left, up, and down to play. You don't need to do that at Punch Quest. 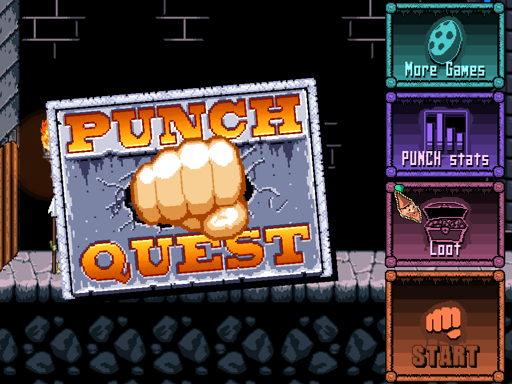 Punch Quest, games which the man (runner) will run and all you need to do is punch your enemies. Kill the skeleton, zombie, witch, skull squid, broke the vas or everything in your face. 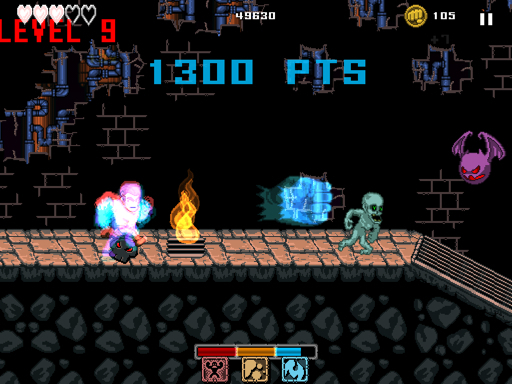 Be careful with the traps like torn wall, fire floor, the magic from the witch, electric strike from skull squid, etc. There're so many skills in this game, make you never bored to play this game. 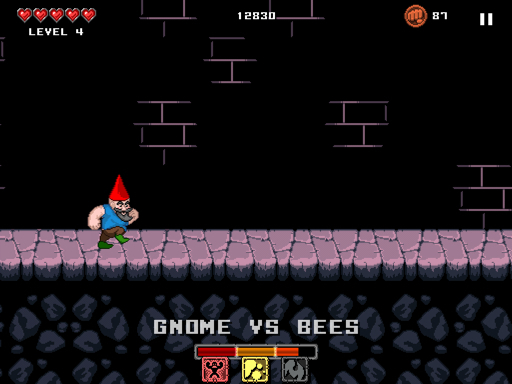 The egg not just contain of dinosaur but it can changed you become gnome, while you become gnome your enemy just bees. All gnome can to do is just roll and roll.. :D hit the hives. 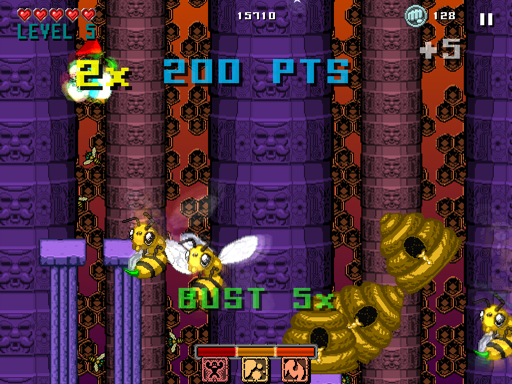 There's power ups which you can unlock in menu (loot) the power ups help you to destroy your enemies easier. 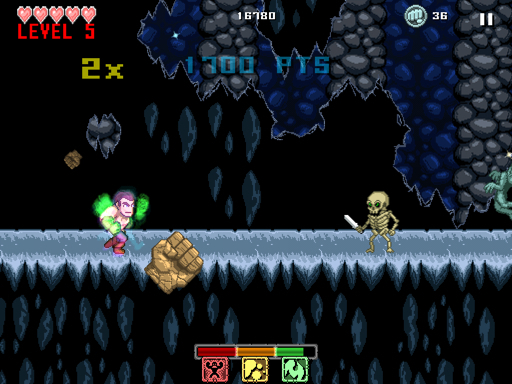 There's a power bar in the bottom of the screen, it shows your power, when you fill up the bar you will get super power. 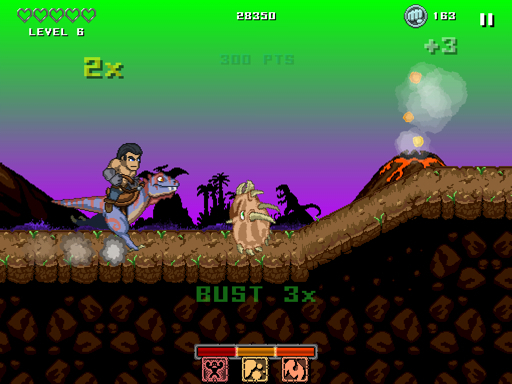 Make you more powerful to destroy the enemies and it's a random power. There are 5 heart life, it will decrease while you get attacked and increase while you punch your enemies, make sure to punch it continuously for make combo to multiply your scores. Collect the Idols too ( I don't know what's those used, but collect those for unlock Game Center Achievement). Wait you don't tell me the game control..
Oops, sorry I almost forgot bout that... The game control is so easy, you just need tap the right side to punch and left side for slam (jump), same control too while you become gnome or ride the dinosaur.. Right now I'll try to give my score about the game which I played for help you to decide (ESP. When you're too lazy to read my review) it's show in bottom part of the text. One this app is free-to-play. IAP YES , Need? Not really. Ads NO. This game isn't a freemium game again, it's already became paid app. Anyway, the min side of this game is your finger will be so tired if you played for a long time, to avoid that just release your finger when the man is running and tap only when the enemies come. One more don't tap too much, it will make the man will move slower.